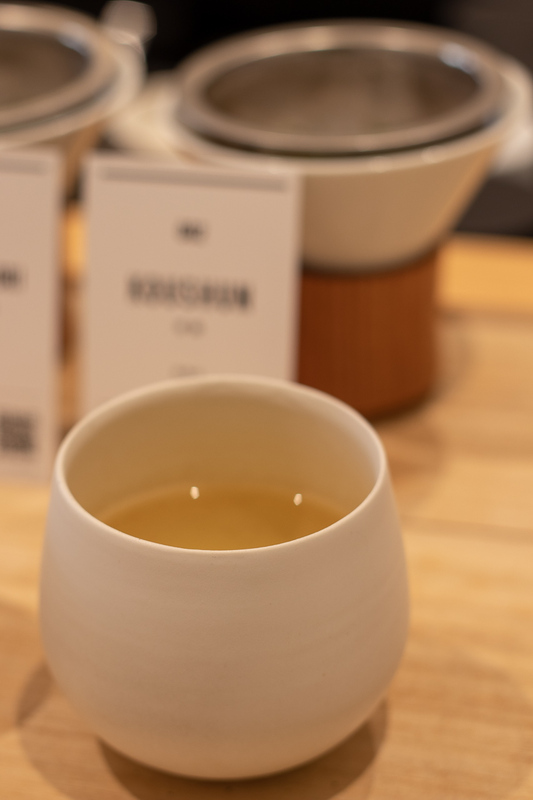 Inspired by third-wave coffee culture, this ultra modern tea bar offers premium, single-origin sencha from all over Japan, brewed with the pour over method that we all know from the coffee world. 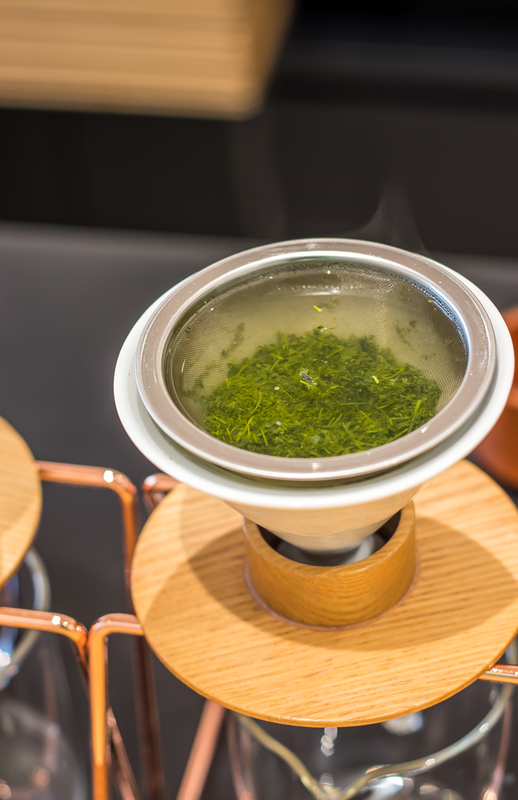 Their pour over tea drippers were specifically designed by the owners of Tokyo Saryo to ensure the perfect brew. 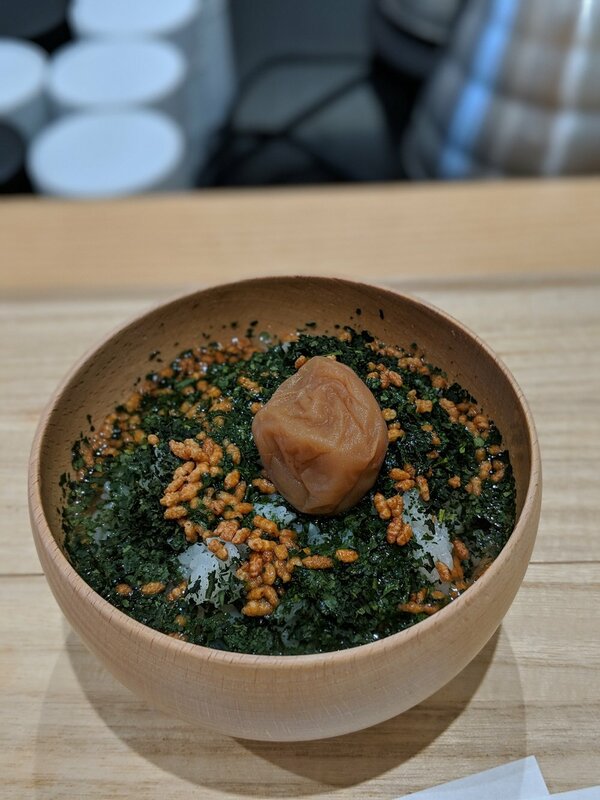 I had booked online and firstly, I was served a delicious bowl of ochazuke, the Japanese tea and rice soup, made with tencha leaves (matcha raw material basically) and topped with an umeboshi pickled plum. Other topping options to choose from include salmon and scallop. While I enjoyed my ochazuke, I got to choose 2 types of sencha to compare and a dessert to pair. 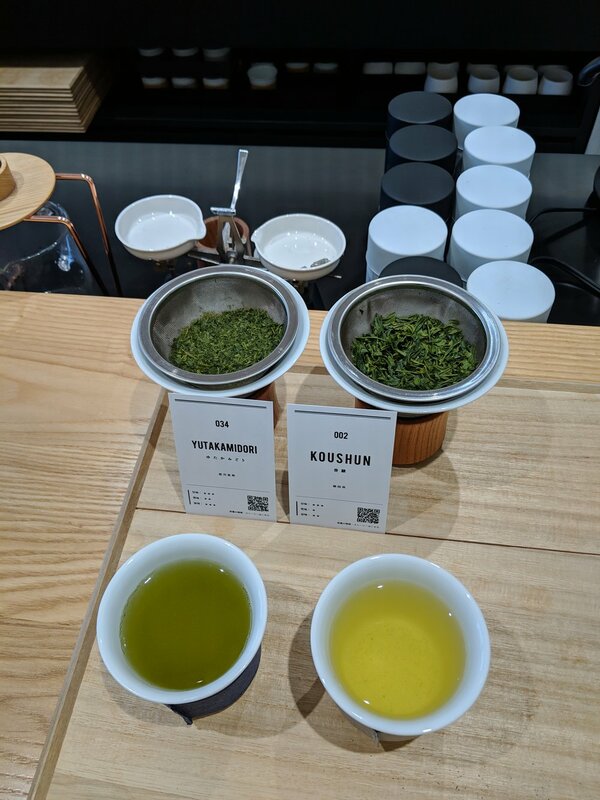 The selection of teas to choose from was portrayed in a graph (see photo) according to their umami, sweetness and bitterness. The tea barista told me that she likes bitterness in her sencha and I realized that in Japan bitterness can be a desirable quality in a good tea. I chose Koushun, a “new” Japanese cultivar created in 2000 through hybridization, and Yutakamidori (also the name of the cultivar). The dry tea leaves to me smell like flowers. In Japan the oxidation of the leaves is halted by steaming. 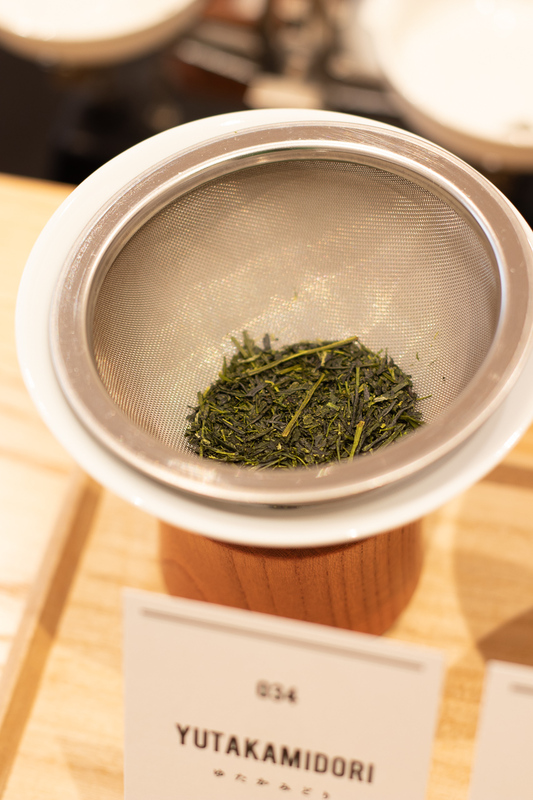 The Koushun sencha leaves appear larger and whole because they were steamed for a shorter period of time compared to the Yutakamidori sencha leaves, which were steamed for a longer period of time and appear smaller and fragmented. 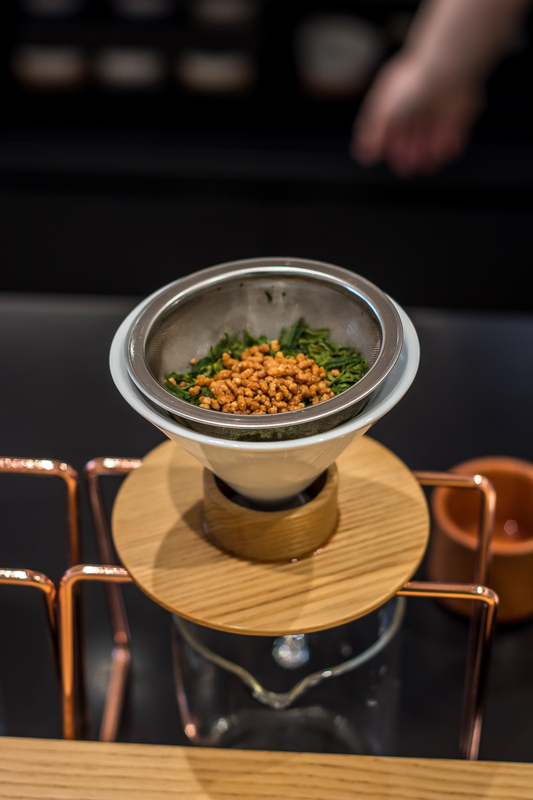 The first infusion was extracted with water at 70 C (158 F), the second infusion with water at 80 C (176 F) and lastly, for the third infusion, I chose which of the two teas was made into a genmaicha and the tea barista added roasted rice to it. I went with the Koushun. As a dessert, I had the hojicha mousse. Additionally, I bought a small pouch of Fukumidori to try at home, the barista’s favorite. I was intrigued to try the more bitter end of the spectrum.